In the Adriatic, you’d think there wasn’t really much extreme weather to talk about, especially if you visited in the high summer. OK, the odd thunderstorm over the mainland in the afternoon, but not out on the islands, surely? Yet you’ll see examples of windroses here and there, with the winds clearly named. There’s one on the wall at Fortica, the fortress overlooking Hvar town. Some of these names would be perfectly familiar on board his majesty’s navy in the 18th century, as well as most other fleets in the Med at the time. Read your Patrick O’Brian novels and you’ll see what I mean. There’s actually a long tradition in the Mediterranean of calling individual winds by name. It sounds rather mysterious and romantic to those of us from around the north Atlantic, who mostly use the compass to define the prevailing wind direction. If we refer to it at all, that is. The seafaring among us might refer to a westerly wind, a southerly or nor’easter, etc all of which evoke a range of conditions from calm to downright stormy! Homer referred to 4 winds in the Illiad and the Odyssey: Boreas, Eurus, Notos, Zephyrus, while Aristotle expanded that to account for seasonal winds. His 12-point windrose was developed further by the Romans, until the medieval map-makers around the 1300s set us up with the familar 8-point windrose we know today. By that time, the names of the winds are pretty universal around the Mediterranean. They mostly derive from Italian, but one of the Greek terms survives, thanks to the Venetians, and a couple of Arabic names have crept in. Tramontana is Italian for ‘from the mountains’, and Levanat ‘from the east’ – ie the rising sun. During the summer and autumn it is common to get a slight Levanat in the morning, its strength decreasing as the sun gets higher. The Maestral (NOT to be confused with the French Mistral) is a nice cooling north-westerly breeze in the summer, another sure sign of a stable weather pattern. And the other names, where do they come from? Bura goes back to the time of the ancient Greeks, whose north wind was Boreas, the bringer of winter. The Venetians kept the name in the Adriatic for the strongest, most powerful chilling wind that comes off the mainland to the northwest. Very specific conditions over the continent set it up, and in a bad bura, the cold air mass rolling off the high coastal range can freeze the sea water below. Thankfully never gets that bad around Hvar and the southern Adriatic! The winds shown on your windrose will vary slightly, depending on what’s important at your location. Obviously the winds are funnelled through channels and deflected by island and coastal ranges. Different parts of the coast are more vulnerable to winds from certain directions. This version of the windrose is on a house near Jelsa, on the northern shore. Here we have Pulenat from the west, and the Jugo (pronounced yugo) has appeared for that all-important south-easterly blowing up the coast. Jugo, of course, is the Croatian word for ‘south’, and it means rain coming at you, and plenty of it. Don’t expect to see the mountains again until it blows itself out. It’s not a cold wind, but it can be stormy. The Šiloko in this windrose has moved, and now comes directly from the south. This is what’s called Scirocco in other parts of the Mediterranean and it actually derives comes from the Arabic al-Sharq (east). 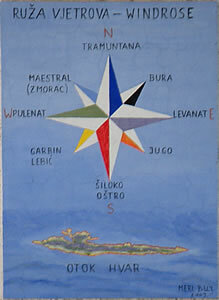 Oštro derives from the Italian austro, meaning south (as in Australia). In Croatian the word means “sharp”, which fits this short-lived winter blast pretty well. It’s unlikely you’ll come across this in the summer. Many of these terms denote very specific types of wind – such as gusting, constant intensity, sudden onset with high waves, and so on. It all reminds me of the shipping forecast on BBC Radio 4 – “it’s choppy in the channel with westerly winds gusting up to 40 knots“! That particular description here would fit the Pulenat, from the Italian ponente, meaning ‘from the west’. It can cause difficult waves in narrow channels, such as between Hvar and the Pakleni islands. In the summer a Pulenat can often come with thunder and lightning, following a period of Jugo. And after the Pulenat, a period of Bura to clear the skies again! The Lebić from the south-west brings stormy conditions, which can get pretty bad in the winter. Not good news for sailors or indeed coastal towns with harbours facing in that direction. Lebić comes from the Italian libeccio and implies the wind that comes from Libya. The alternative term Garbin derives from the Arabic al-Gharb via the Italian agherbino, which by the sixteenth century had evolved into garbino. Incidently, the Arabic gharb, meaning ‘west’ is also the root of the Portugese ‘Algarve’. Many thanks to Bojan Bujić for his fascinating research on the derivation of the terms. 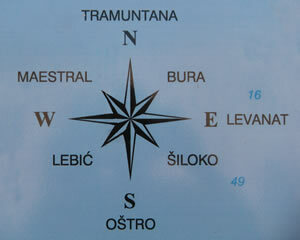 We’ll get together for coffee in Stari Grad one of these days! The National Oceanographic and Atmospheric Administration has a great photo reference. Thanks to them for the image of the medieval Italian windrose.